Enter a title for the Recurring appoitment element here. Further information about this topic can be found here. In these drop-down lists, select the fields that contain the start and end of the appointment. Defines how many appointments will be created in total. In this, the interval is used that is defined by the user in the browser. The start date will be repeated accordingly daily, weekly, monthly, or yearly. Please note that entering a high value for the series duration may cause high levels of system load. This setting causes all data fields in the current data group to be listed. The value that is chosen for the start date will be applied to all new appointments created by the recurring appointment. 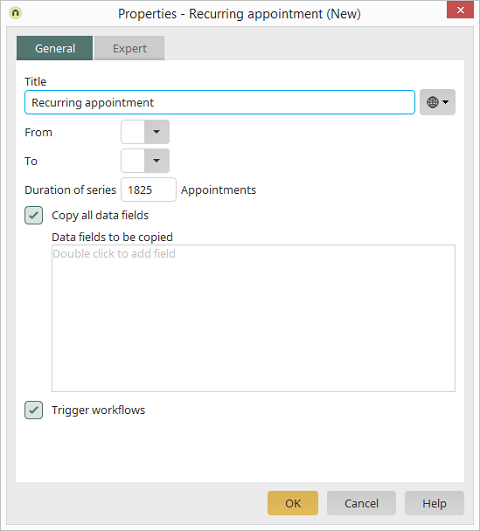 To do so, Intrexx uses a separate "Recurring appointments" data group where the new appointments are stored. If the "Copy all data fields" setting is not active, you can double-click on this area to open a dialog where data fields can be selected. If data fields have already been selected, you can use the context menu to add additional data fields or remove existing ones. With this setting, processes connected to the start date will be initiated, as well as for subsequent appointments. Disable this setting if this is not desired.